Once again, the PI-in-training hero of Gumshoe and Gumshoe for Two is fighting crime his way. Mort Angel (and he’s quick to explain it isn’t “Mortimer” which is a birth certificate error) is hot on the trail of a murderer. Still recovering from his last case and the death of his fiancée, Mort is relaxing in the Green Room of Nevada’s Golden Goose Casino, listening to the latest news: Celebrity rapper Jo-X has disappeared. Immediately, he’s distracted when he’s approached by a young woman wanting to hire him. She doesn’t give her dad’s name. Just her own. Danya. She tells Mort to call her in the morning. Mort’s on his own for a bit, with his boss, Ma Clary, out of town, so what’s to stop him from taking a case? The young lady is Shanna, Danya’s wife, who’s as close-mouthed but sharp-tongued as Danya is. A surprise is awaiting Mort in their garage, however. From that point on, things go from worse to whatever the next step after worse is. Discovers abound. Danya is the daughter of Reno Detective Russell Fairchild, Mort’s bête noir, who forces himself to overcome his prejudices and hire the PI to take his daughter’s case. For reasons not immediately available, Shanna, disguised as a mysterious woman named Celine, has been dating Jo-X, and may have been with him in his desert hideaway before he was killed. In Jo-X’s pocket is a receipt for a motel room in Caliente, and a flash drive marked Celine. An investigative reporter called The Wharf Rat has been following Shanna. Ma Clary, Mort’s boss, has ordered him not to get into trouble while she’s out of town, but that doesn’t mean he can’t do a preliminary investigation. Soon Mort’s heading to Las Vegas. Along the way, he acquires a sidekick who plans to make the association permanent. Lucy looks 17, is 31 (it’s been verified) and can give as good as she takes in the smart-mouth department. She’s also beautiful, diversely talented, and will turn out to be the best partner Mort could ask for, in more ways than one. With a stay at a desert inn that could give the Bates Motel a few pointers, and a confrontation with a mother and son murder team, a disguised Mort and Lucy soon find themselves up to their necks in a mystery of another kind involving the deceased Jo-X and culminating in a shoot-out in the desert to end all shoot-outs. As the title implies, Mort Angel is a loose cannon of a gumshoe, and the narrative is by turns wild, irreverent, dangerous, and deadly. Showing the definite influence of many of the crime noir detectives of yesteryear, Mort himself comes off as a combination Philip Marlowe and Mike Hammer with a generous dash of Maxwell Smart. Under Mort’s narration, the story is told with tough-guy wit and humor. The banter between Mort and Lucy may remind older readers of the Thin Man dialogues of Nick and Nora Charles, with its pithy pronouncements and double entendres. Comparisons aside, this PI-in-training is one funny dude who is also very well-equipped to do what has to be done in the detecting department, and he ain’t so bad with the ladies, either. 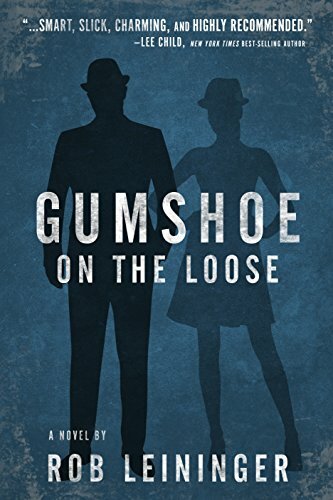 Gumshoe on the Loose is an easy read. The narrative acts as a lure, tempting us to follow the clues, creating a desire to continue reading. Once this novel is picked up, the reader will be reluctant to put it down, not only wanting to discover whodunit, but also because of that snappy dialogue. Mort does have a talent for a turn of phrase. Bring on the next adventure, Mr. Leininger. We’ll be waiting!